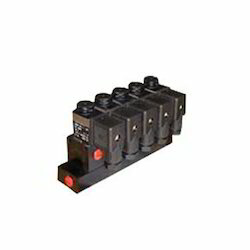 Our simple but rugged design Directional Control Valves have found wide acceptance in the industry for more than two decades as they can perform in the toughest of working environments. These DCVs can be operated by a range of Manual, Machine, Solenoid or Pilot operations. 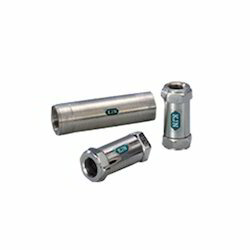 They are available in 1/8" BSP and ¼" BSP port sizes. 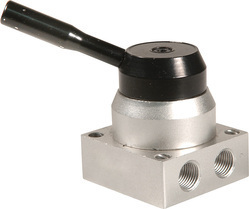 These Compact Solenoid DCVs are ideal for applications where space is a major constraint. Due to their sophisticated design these DCVs consume very little power, they operate on only 3 Watt of DC power. 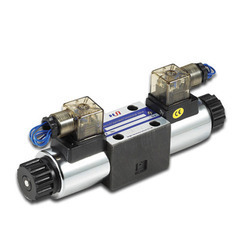 These DCVs can be assembled into gangs of pneumatic valves tailor made for your application. Fluid Pressure 0.5 Kg/cm2 to 25 Kg/cm2 max. Non-Return Valves are available in sizes 1/4" to 1" BSP. 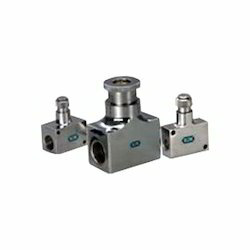 They are used in applications where unidirectional flow is required. Non-Return Valves are used where flow in one direction only is required, and flow in the opposite direction must be blocked. An example of their use is as a safety device to prevent loss of pressure in the event of air supply failure. Non Return Valve has a spring loaded poppet which allows flow in one direction. The valve opens in the direction of flow when the pressure in the line exceeds the force of the spring In the opposite direction there is no air flow as the poppet blocks the air passage. They find application in pneumatic circuits where finite flow control of air is required. The unique design of KJN Flow Control Valves does away with the cumbersome locknut required in valves of other make. Port Size 1/8" to 1" BSP. 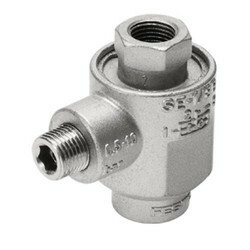 These find application in a pneumatic circuit where unrestricted, direct exhaust from a pressurized system is required. Example of such an application would be increased speed of a cylinder piston by allowing quick exhaust of the back pressure on the piston. Quick Exhaust Valves are available for port sizes ranging from 1/16" to 1"BSP. Quick Exhaust valve is used to allow direct exhaust by unrestricted flow to atmosphere from a pressurized system. They are used for increasing piston speed of pneumatic cylinders upto 3 times by allowing quick exhaust of the back pressure on the piston when mounted directly on the exhaust port. Another example of their use is for rapid closure of the pneumatic brake of a power press. The valve consist of a cup seal precision guided in the body. When the pressure is reduced on the supply side (through the directional control valve in the system) the cup seal opens for direct exhaust to atmosphere. The cup seal provides for long life even at high frequency operations, e.g. on high speed power presses. The exhaust side of the quick exhaust valves of sizes ¼" BSP and above are furnished with standard ports with female thread. The exhaust port can be fitted with an exhaust silencer if required to reduce the discharge noise. Pneumatic Rotary Valves is a type of DCV. Pneumatic Rotary Valves are available in 2-way, 3-way or 4-way constructions with a knob or handle for operation. These find application in instrument pneumatic rotary valves, control panels, air-started generators, material handling equipment, etc. Pneumatic Rotary Valves are a type of directional control valves which are used for control of pneumatic cylinders or as part of large pneumatic circuit, They are largely used for panel mounting applications. Pneumatic Rotary Valves are very rugged in construction. They consist of a body, cap and large bore poppets through which the air passes. The valve is operated using a knob provided on the top with an operating lever provided optionally for ease of operation. The valve is also provided with an optional MS powder coated plate for mounting of the valve on to a panel. Looking for Pneumatic Valves ?